Form R-8697 is a Louisiana Department of Revenue form also known as the "Louisiana Interest Computation Under The Look-back Method For Completed Long-term Contracts". 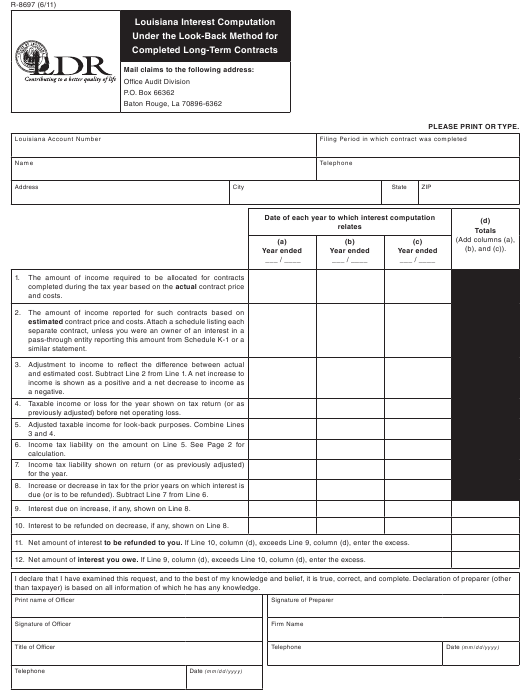 The latest edition of the form was released in June 1, 2011 and is available for digital filing. Download an up-to-date fillable Form R-8697 in PDF-format down below or look it up on the Louisiana Department of Revenue Forms website. previously adjusted) before net operating loss. due (or is to be refunded). Subtract Line 7 from Line 6. 9. Interest due on increase, if any, shown on Line 8. 10. Interest to be refunded on decrease, if any, shown on Line 8. 11. Net amount of interest to be refunded to you. If Line 10, column (d), exceeds Line 9, column (d), enter the excess. 12. Net amount of interest you owe. If Line 9, column (d), exceeds Line 10, column (d), enter the excess. than taxpayer) is based on all information of which he has any knowledge. such amount is properly taken into account, pay or shall be entitled to receive interest computed under the look-back method. Form 8697 and any required schedules. evidence that a person has deliberately overpaid a tax in order to derive the benefit of the interest allowed by R.S. 47:1624.
the due date of the return for the filing period OR the date the return for the filing period was filed and the income tax was paid in full. contracts, interest is calculated from the due date (not including extensions) of the return that generated the NOL. until the due date (not including extensions) of the return for the year generating the carryback. out to seven places to the right of the decimal. You will need to do a separate calculation for each year in which interest is owed or is due. Example: Assume the 2011 interest rate is 4 percent, divide 0.04 by 365 to get the daily interest rate of 0.0001095.
highest rate of tax specified in R.S. 47:32, namely 8%. Refund Due. Mail Form R-8697 and supporting documentation to the address listed at the top of Page 1.
documentation to the address listed at the top of Page 1.